Since launched, the Surface RT tablet has always been sold only through two channels in China: Microsoft's freshly established online store, and Suning (a chain store for electronics, much like Best Buy). Now Microsoft is looking into extending the Surface RT distribution network, as the exclusive dealership with Suning expired in February 2013. According to word on the street, Microsoft isn't that happy with the sales of Surface RT so far through Suning. The distributor simply hasn't been pushing Surface hard enough: advertising is scarce, customer service tends to be sloppy, and even the sales representatives don't seem to know a lot of Surface tablets. Now Microsoft is taking four new distribution partners aboard, aiming at bringing Surface RT up to the hit that it deserves to be, and pave the road for the upcoming Surface Pro. With vastly expanded offline showcase opportunities and online availability, hopefully Surface tablets will become a more common sight on Chinese streets. Oh, and people still can buy Surface RT from Suning. The deal to sell is still there, only not exclusive any more. As of 22:00 March 21st 2013 (Beijing time), both Sundan and One Zero have put up Surface RT banner advertisements on their front pages.360buy is staying all quiet about that matter. We cannot check on PC Mall because of such late hour and its lack of online stores. 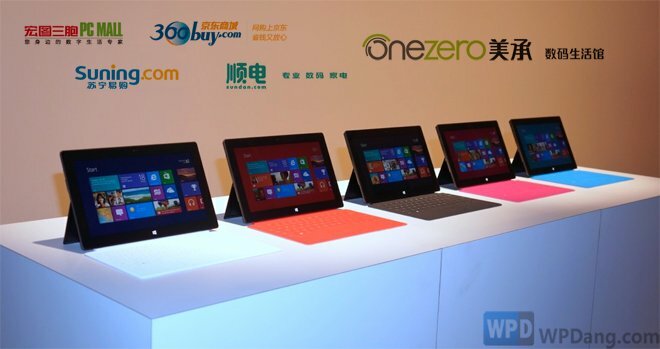 Aside from these, Microsoft has built yet another official online store on China's largest e-commerce platform Tmall. Click here to visit, and witness HUGE banner ads for Surface RT as well as Lumia phones. Tmall is probably a million times better known and more frequently visited than Microsoft's original online store. Establishing a second store front there looks like a wise choice.